“Available May 1: this is a recently-renovated (within the past 18 months) studio apartment in a Columbia Heights rowhouse. 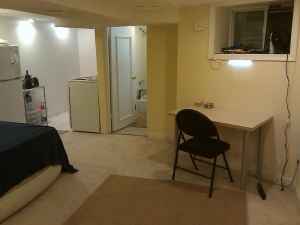 It is a GREAT DEAL for your own, private studio in DC. It has new tile bath and kitchen (granite countertops in both). Carpeted. Very clean. There is laundry in-house (adjacent to the room), cable TV, and high-speed internet+wifi. Power and gas are paid separately, split with all tenants in the house (though rarely exceeds about $75). Pet deposit is $250 + $50/mo (no dogs though). The neighborhood is great: it is ~3 blocks to the Columbia Heights metro, “DC USA” shopping mall (with Target, Best Buy, etc. ), 11th street bars and restaurants (such as Wonderland, Meridian Pint). You can also walk (~1 mile or less) to Adams Morgan, U Street, and the 930 club. Also, within a two blocks are bus lines that take you to downtown, Adams Morgan, Dupont, Potomac Park, Van Ness, Cleveland Park and Tenleytown. (Buses 70, 71, 79, 64, H1, H2, H3, H4, H8). The only drawback to the apartment is there is a low ceiling (6’6″) with a duct that comes down the middle to about 6′, so it will be most comfortable for someone below that height. I’m curious what you guys think about, “if there is more than one adult tenant, there is a $300 additional monthly fee.” Have you ever seen that before? Anyway, let’s assume it is one person – does $1000 sound realistic for this basement apartment?